We would like to provide an enjoyable and extraordinary blend of ancient and modern cultures for the members of the EADMFR, all participants and accompanying persons, in which special scientific presentations and social events will be organized. We are determined to maintain the highest standards our participants have come to expect from the European meetings of the EADMFR. We will provide a fitting atmosphere and environment for the most recent developments and state-of-the-art practices of our profession. To this extent, we aim to offer a venue for showcasing scientific exchanges, from Keynote Speakers world known leaders, to both oral and poster presentations as well as other formats in the form of workshops, round tables and possible live demonstrations. Including all areas of maxillofacial radiology, new clinical and research developments in diagnostics, technical modalities, 3D innovations, Artificial Intelligence applications and education. More than 90 airlines have regular flights to and from Ben-Gurion International Airport (located 40km from Jerusalem and 15Km from Tel-Aviv), providing direct connections with hundreds of other airports all over the world. 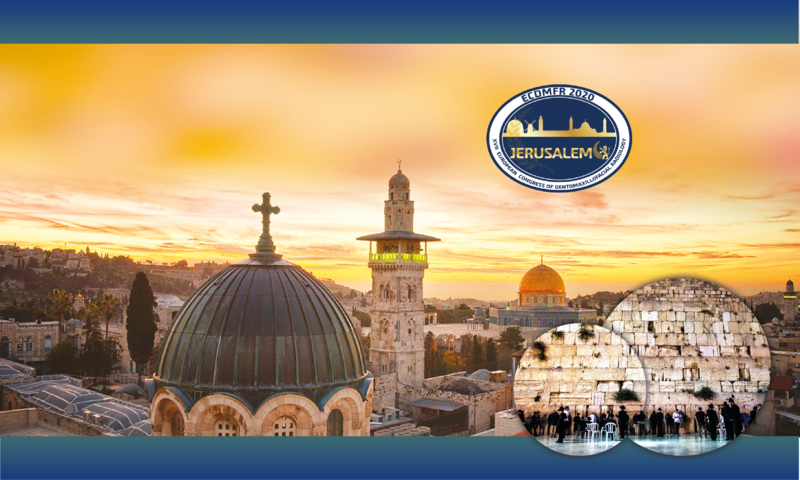 Jerusalem is a city that has many attractions, old and new, all within walking distance of the city centre where the congress venue is situated. Maxillofacial radiology is constantly evolving and is essential for all different fields in dentistry, this conference is ideal for meeting dental and medical professionals from all over the world, and a great opportunity for exchanging clinical knowledge and research innovations among practitioners form all different areas in dentistry and head and neck radiology. The sprout of maxillofacial radiology in recent years depicts the urge prerequisite to recognize our specialty all over the world and this congress is the most suitable stage to present and share our knowledge as well as to discover new technologies from our colleagues, industrial partners and exhibitors.